It seems we have a habit of catching flights at the very last minute. We got up at 7:30 aiming to leave at 9, but I'd not realised that the airport was almost an hour away and given our flight was 10:40, it left us very little margin of error for checking in. After a quick shower, Felix put pedal to metal and we screamed along the freeway. It was looking like we might have a comfortable window until we missed a turning and then got stuck in traffic. With forty minutes to go before the flight, we arrived at the airport, said hurried but very grateful goodbyes to Felix, and headed to the luggage drop only to find we had to go to another desk to pay a Galapagos tax we hadn't banked on. Forty dollars later, we were checked in and running to the gate via a hasty stop for extortionately priced water (we had to get used to paying $3 minimum for 500ml it seemed, water giving alcohol a run for its money per milliletre). Somehow, we'd made the flight. Two hours late we touched down. More fees ensued, including the $100 per person park entry, and a ludicrous $10 return bus ticket which is apparently free for other airlines...not TAME though! At the airport we were met by Padi, a guy who our upcoming couchsurfing host Andrés had pointed in our direction. He was offering a tour through his company for a very attractive price for 15 days. A little too attractive, it seemed. After some prodding, we found out he worked for Iguana Tours who I'd heard nothing but bad things about on the internet. After asking where his office was, he became incredibly evasive saying that everyone in town knew him - bars, hotels, restaurants - like he was some sort of mafioso. Then he said he was rarely at the office and that we should communicate via WhatsApp. The final straw was when he couldn't tell us what the grade of the guide he supplied was. This is important: all guides in Galapagos are registered with the government and graded from 1 to 3, with the lowest being competent but inexperienced, and the highest being very experienced. First he said his guides change each day so he didn't know what grade we'd get, then the story changed and we were assured our guide would have at least thirty years' experience. At that point we politely told him it was time to catch the bus, and beat a hasty retreat. Then it was onto a ferry, then another bus, before finally arriving in Puerto Ayora. What followed was one of the most crazily stressful periods of my entire travelling history, which I'm sure Gilly will attest to. We'd not booked anything in Galapagos at all: day trips, cruises, even accommodation had been left to the last minute. This was deliberate, since we'd read (and been told by people like Richard and Sara who'd experienced it first-hand) that you can make serious savings by showing up and being flexible. The hotel was easiest. 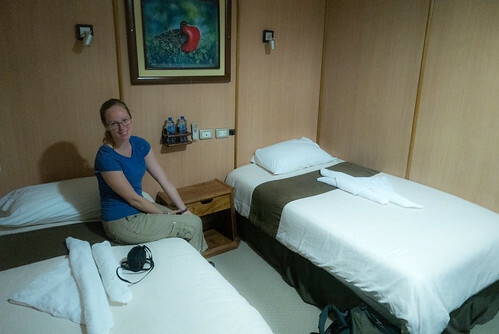 We got off the transfer bus and a woman offered to show us a room nearby in Costa del Sol Suites which ticked all of our boxes for forty dollars, pretty much a bargain on the island. That done, it was food time. We found a cheap eatery on "restaurant street" for $5 for a huge plate, and wolfed down grilled fish, chicken and carbs. Then it was time to find a cruise. We'd originally planned to island hop ourselves, and while you can certainly visit some of them on day tours and stay there if you like (Isabela and Cristobal), the outlying islands are only reachable on longer cruises. We started with Mockingbird Tours, where a guy called Sergio bombarded us with more information than we could process, with ever-changing itineraries and prices which we were simply unable to follow. You see, on each of the Galapagos islands there are only certain spaces for boats to visit each day so itineraries circulate between boats; one week a boat might visit the southern islands including Floreana and then the following week head north or west. As such, you are left to choose from whichever boats are going to the places you want to visit at any given time. Furthermore, there are three classes of boat - tourist superior, first class and luxury. The comfort levels and the price increase in a mutually inclusive manner, so if you have an itinerary in mind but don't want to shell out five grand, you may well have to change your plans. We visited a couple of other agencies including Moonrise (run by an efficient lady who was big on boat knowledge but small on itinerary detail) and an agency near Mockingbird run by a guy called Jorge who only had a tiny boat which didn't hit the spots we wanted. Back with Sergio, we were on the brink of booking an 11-day excursion made up of the tail end of a 3-day cruise and a full 8-day cruise. The problem was that they wanted cash. This is something you probably won't read about: if you don't have thousands of dollars in hard currency and want to pay by card, you're looking at paying up to 21% extra in fees. It's absolutely crazy. As we tried to work out how we could withdraw enough money on our two remaining cards when the limit per day combined was $800, we went back to the hostel to see if we could move our room booking to when we returned. The woman refused, and I couldn't really blame her. I'd stupidly paid up front rather than at checkout, so I'd basically just chucked away $40 for them to mind our bags for a few hours. She did point us in the direction of another agency across the road though, run by a lady called Yoconda. She seemed lovely, ran through all the itineraries we wanted but said the space that Sergio said was available actually wasn't. It seems that there are enterprising resellers of boat seats that buy rooms in bulk from the owners and then sell them back to agencies for a profit. So when we confronted Sergio about this, he was trying to get hold of the guy that had bought the seats that were supposedly going to be ours. However, he couldn't get through. It meant that we could definitely have seats for the first three days of the trip, but he was reliant on a) getting through to the reseller and b) being able to buy them off him. The entire situation was farcical. It felt like I was in some sort of tropical Wall Street, with agency staff on phones all over the place buying and selling, haggling and pleading. We simply couldn't take the risk that Sergio would get us the room for the remaining trip, not least because he was leaving the following day to go on holiday for a month. Back at Yoconda's, she offered us a four-day trip leaving two hours later that night on a first class cruise - Yolita II - in a matrimonial room, with a potential option for moving to the Guantanamera if she could secure the seats before our end date, and if not, a free tour to the highlands. Tired, hot, and drained from all of the negotiations, we accepted. We forked out $600 each, I made a pit-stop at a pharmacy for sea-sickness tablets, cash from an ATM, and some postcards, then headed to the dock where there were two sea lions just sprawled out asleep on a bench, because why not? Gilly told me that while I was away, Yoconda had told her we'd have two beds in our room, not the double we'd paid for. Surely she wouldn't have lied about that to us? We got on a zodiac to shuttle us to the Yolita, and found out that yes, she had lied. It wasn't the end of the world, since we just pushed the beds together, but I was furious at the deception. It seems that finding an honest agent in Puerto Ayora is near impossible. Yoconda was due to meet us when we docked near the airport at the end the four days, so I resolved to have a chat with her about ethics at that point. Until then, we were introduced to Briandy and Mani who were part of the serving crew, and who made us feel right at home, before collapsing into the (actually very comfortable) beds. Unfortunately for Gilly, the motion of the waves proved too much, and I awoke a few hours later to her being violently ill in the bathroom. Somehow the sea didn't affect me, which was unusual as I normally feel at least a little queasy. Consequently, Gilly was exhausted from lack of sleep the next morning. Not the best start to a dream excursion, but thankfully this was as bad as it got for the rest of our stay on the islands.